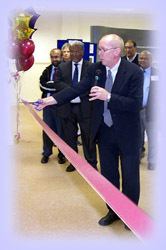 The UK's first permanent Islamic Exhibition for groups from Schools, Colleges, Universities, the Police and the general Public was opened in Birmingham, by Tony Howell, the Chief Education Officer in 2003. To date, over 150,000 people have visited the Exhibition and benefited from its facilities. The Exhibition has been set up to help support Islamic studies in schools and colleges at all levels. It can also deal with bodies of people interested in learning about Islam such as police cadets working in mostly Muslim areas and other such social groups. Its aims are to help educate people about Islam, to dispel some of the myths about Islam and to bring a better understanding of Islam to people residing in the United Kingdom. The Exhibition, which is FREE, is taking bookings for parties of up to 60 from January 2004 and thereafter.